Study offers essential data on workforce practices, employee compensation and engagement, and the make-up of the workforce. 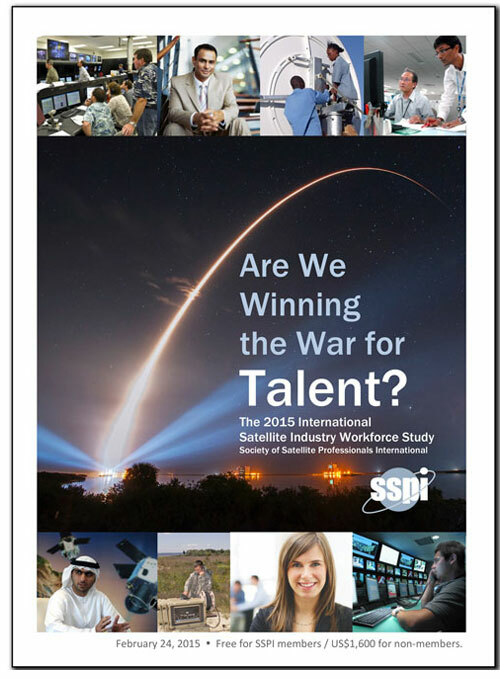 February 24, 2015 – New York City – The Society of Satellite Professionals International (SSPI) today released Are We Winning the War for Talent? The 2015 International Satellite Industry Workforce Study. It is the satellite industry’s first multi-company, multinational study of workforce practices, employee compensation and engagement, and the make-up of the industry’s workforce. The report, the first in a series, aims to share best practices in attracting and managing talented people, and to spark a management dialogue on collective actions to improve the industry’s performance. The report compares compensation across job categories and regions including base salary and incentive payments, and analyzes employee engagement at all levels. It depicts an industry whose workforce remains stable but which faces drastically changing needs for skills and expertise and which is in the process of replacing an aging workforce. Yet 60% of companies report having no formal internship or work-study programs to attract graduates, and all face the challenge of recruiting into an industry of which students are largely unaware – despite offering attractive pay and a good working environment. Despite the industry’s challenges, 83% of respondents reported that their current compensation was the same or higher than the peak of the past four years. Are We Winning the War for Talent? is based on interviews with human resources leaders at major satellite industry employers in North America, Europe and Asia, as well as an online employee survey that attracted 740 respondents from 44 nations. This combination provides a high-value portrait of an industry in competition with the biggest names in technology for the talent it needs to power the future. SSPI conducted the study in partnership with SpaceNews and with the support of Satellite Markets & Research. Other organizations helping promote the survey to their memberships included the Satellite Industry Association, Global VSAT Forum, CASBAA, European Satellite Operators Association, World Teleport Association and the International Space University. Are We Winning the War for Talent? is available on SSPI’s website. It is free for SSPI Members, and is available on a paid basis for non-members. For more information and a copy of the report, visit www.SatelliteWorkforce.com. The Society of Satellite Professionals International is a professional development society. We promote the growth of the industry by educating the public and end-users about the indispensable contributions of satellites to business, government and human welfare, and by connecting satellite professionals worldwide through education, knowledge-sharing and fostering professional relationships. For more information, visit www.sspi.org.